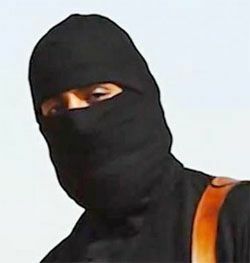 The Daily Mail reports Britain's elite members of the Special Air Services (SAS) have been sent to the Middle East to locate the black-clad ISIS executioner in the hostage killing videos of British citizens David Haines and Alan Henning (who also appeared in execution videos of Americans John Foley and Steven Sotloff, and most recently threatened Peter Kassig.) It is reportedly the SAS' largest mission since 9/11. In August, the British press reported the formation of a joint task force of the SAS and US Navy Seals to take out ISIS leadership. Ret. Gen. John Allen, who is in charge of the U.S. response to ISIS, confirmed today that the U.S. will not be training and equipping the Free Syrian Army rebels. He said the U.S. will start from scratch, vetting and then training Syrian opposition fighters. He also made it clear Iraq comes first. The Syrian arena is important, Allen said, but to the U.S., “the emergency in Iraq right now is foremost in our thinking.” There will be a simultaneous training-and-equipping campaign for Iraq, where the U.S.-trained military collapsed during the Islamic State’s summer offensive.